2018 MIAA Symposium Weekend & AGM. at the Treacy Centre, 126 The Avenue, Parkville, Vic. Are the archetypes relevant in today's world? 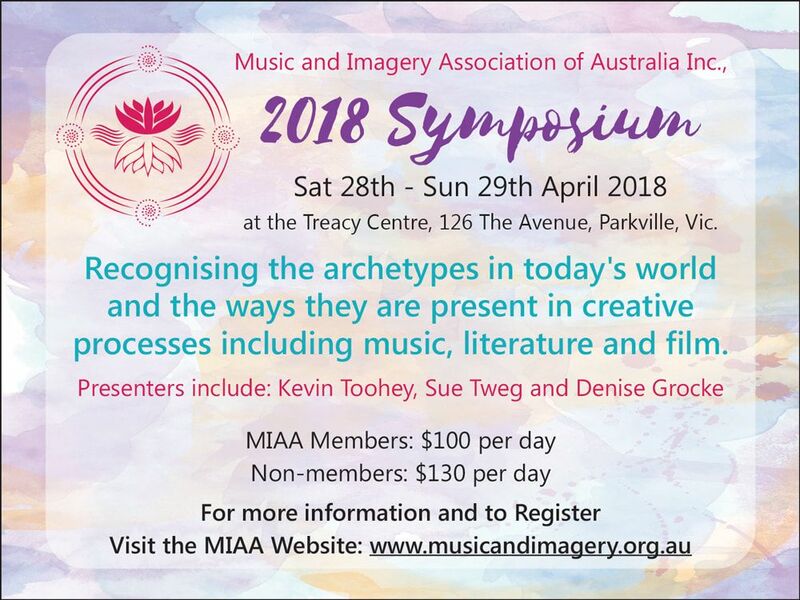 Presentations and discussion on recognising the archetypes in today’s world and the ways they are present in creative processes including music, literature and film. ​“Archetypal symbols in a Fairytale and Alchemy” Part 1. Presentation & Case Discussion on Archetypes in Music - Dr Denise Grocke & Jennifer Marr. Presentation: Sue Tweg on archetypes in literature. ​Participants will be aided in constructing a story from components, or props, then illustrate how some now loved ‘classic’ literary works have followed this model … or not! Presentation: Pat Hamilton “Engaging with the light and dark side of our personal archetypes through the movies, focusing on the Hero’s Journey particularly as depicted in the movie “Collateral Beauty”. Afternoon tea will be provided and will flexible re time. Kevin studied at the C.G. Jung Institute of Zurich. He has worked for over 20 years as an analyst and lecturer at home and abroad with an emphasis on dreams, fairy tales and individuation. Professor Emeritus Denise Grocke is a GIM Primary Trainer and conducts her own trainings through Avalon GIM Training. She is co-author of Receptive Methods in Music Therapy (2007), co-editor of Guided Imagery and Music: The Bonny Method and Beyond (2002), and co-editor of Guided Imagery & Music and Music Imagery Methods for Individuals and Groups (2015). She was awarded the Order of Australia (AO) in 2016 for her pioneering contribution to professional associations and to music therapy. As a GIM therapist, Jenny uses music psychotherapy methods specializing in issues of grief and loss, depression and spiritual growth. She has a particular interest in researching the influence of music in the GIM process, including the presence of symbols and metaphors heard within the music itself. BA(Hons); M ATh (AThR); Grad Dip GIM; Dip Theo. Annette is an Arts Psychotherapist who has utilised the arts as a form of therapy since 2000. She has worked with a diverse range of people and ages, as well as in various community and hospital settings (Mental Health, Drugs & Alcohol, Palliative Care, Aged Care and Disabilities). Annette currently works as a Team Leader (Creative Arts) in a dual diagnosis hospital and has specialised in trauma work, but is also interested in emotional wellness and the ageing process. Meredith is a qualified and motivated Registered Music Therapist with a breadth of experience. As well as her private work, Meredith has experience working as a Music Therapist in early childhood, community health and the disability sector. She has facilitated Music Therapy groups in adult mental health and with drug and alcohol inpatient therapy groups. 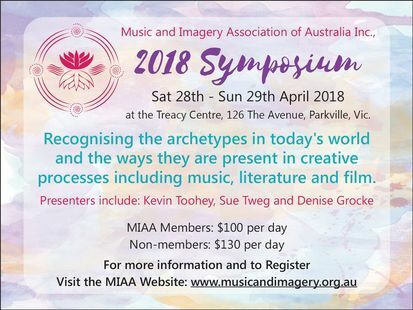 She is currently the VIC/TAS State Manager for an early intervention music therapy organisation, which focuses on using music to strengthen vulnerable parent child relationships. Meredith has delivered presentations at professional conferences, including a poster presentation at the European GIM conference in Vadstena, Sweden. She is interested in common symbolism and imagery that occurs in both a psychedelic induced experience as well as a GIM session, and she hopes to one day re-integrate GIM into the psychedelic psychotherapy field. Meredith is in the final stages of completing her Level III (Graduate Diploma) in Guided Imagery and Music at University of Melbourne. Until her retirement a few years ago, Sue had spent over thirty-five years teaching , doing theatre and film research and making performances, mostly at Monash University and with early music groups around Melbourne. She was a Senior Lecturer in English and Deputy Director for the Centre for Drama and Theatre Studies. What is so important about movies? The best movies can engage us on a deeper level. Much deeper than one would realise, especially when we look closely at the Hero's Journey. We are all heroes in our own life - every day, project or goal we set is a journey and we all have the potential to change in the process. Movies can act as a mirror where we can be affirmed or confronted. Transformation can be experienced when we engage with the Archetypes who are within us. Getting to know our strengths is just a important as coming to terms with our weaknesses. Movie: “Collateral Beauty” starring Will Smith. We travel with Howard (Will Smith) as he flounders around in the Belly of the Whale of grief and despair until his companions come up with the intervention which has the capacity to either kill him or heal him. When I walked out of the theatre after seeing this movie, my daughter said, 'Well, I don't know about you, but I think we have just seen the best movie of the year" - and that was in January 2017! She was right. It engaged me on so many levels. I could identify with every character, while watching their transformation from fragmentation to wholeness. It is inspiring. Please enjoy watching this movie in preparation for attending the presentation on Sunday 29th April.